Folex offers the most innovative range of coating forms with high dimensional stability: Compressible or transparent, with aluminium or polyester carrier, self-adhesive, for UV or aqueous coating, with polymer for high gloss levels. The product range is continuously tested and refined in intense cooperation with press manufacturers. 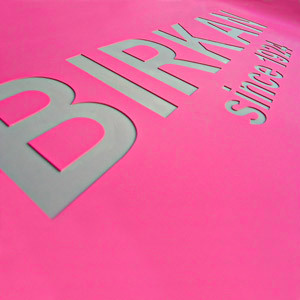 For many years, BIRKAN has been and is being distributor of Folex press room products. Folacoat coating plates make it easy for you to create an individualised form tailored to your job. The coating and non-coating areas are defined by partially removing the transfer layer at the non-coating areas ("stripping") off the press. Of decisive importance for trouble-free production are the time-proven Folacoat surface polymers, which were developed specifically for transferring coatings, not inks.